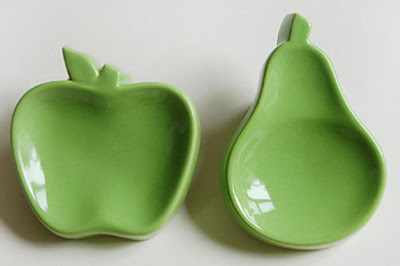 I've always loved the bright Tupperware-style ceramics from Yoyo Ceramics, but it's the new apple and pear combo which has really caught my attention. I am always having to fish tea bags out of my sink - these would be a perfect solution. Available in lots of colours, including red, orange and mint green, they have lots of alternative uses too - use them as a tiny dish for serving pre-dinner snacks, or take them out of the kitchen altogether and store earrings in them at your bedside. Oh.. am I happy to have stumbled on to your blog. these are lovely. the colors are great. Like the idea for the earrings. Although I should perhaps stick with my iittala bowl that I use at present. It is the credit cruch after all - I cannot just change things on a whim. 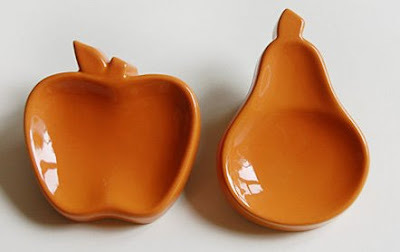 i love unique ceramic dishes.